The mobile app ecosystem isn’t poised to decline any time soon, according to a new study from Compuware, which finds that the majority of smartphone users (85 percent) still prefer mobile apps to mobile websites. Users believe apps to be more convenient (55 percent), faster (48 percent) and easier to browse (40 percent). That data isn’t shocking, of course – native experiences do tend to work better, after all – but what is interesting is how low users’ tolerances are for apps with problems. 79 percent report that they would only retry an app once or twice if it failed to work the first time. That’s a low enough percentage to having mobile-first companies shaking in their boots pre-launch. 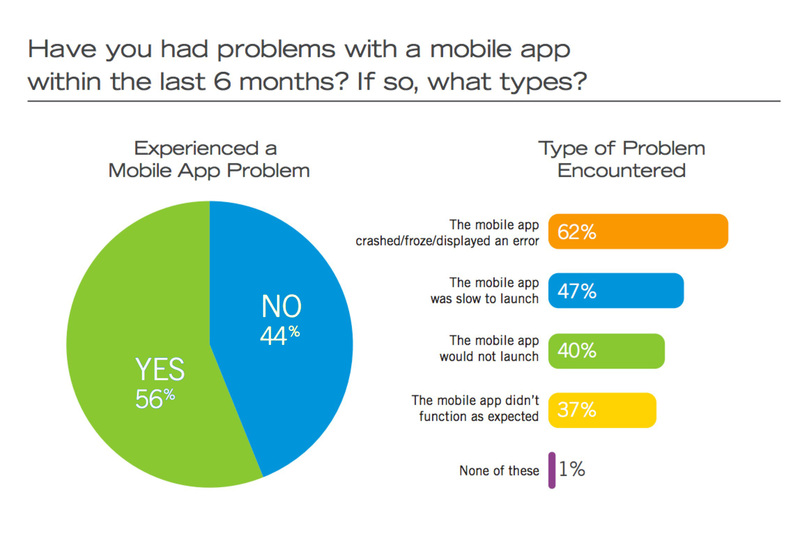 Today, more users have encountered problems with apps than those who have not. Compuware says that 62 percent of users had experienced a crash, freeze or error with an app or apps. Another 47 percent have seen slow launch times. And 40 percent said they’ve tried an app that would simply not launch at all. To get this data, Compuware commissioned a study with Equation Reach who surveyed 3,534 total respondents across the U.S. (the majority – 1,002 people), the U.K., France, Germany, India and Japan, who had used either a smartphone or tablet in the last six months that required an Internet connection. Now the company, let’s be clear, has a vested interest in releasing such data – it sells application performance monitoring solutions meant to address such issues. But though such a non-neutral position should have your guard raised in general, in this case the findings sound just about right. The study was performed last October – around the same time when analytics firm Flurry also detailed changes in app engagement among mobile consumers. At that time, Flurry reported that the average frequency of use by week across all categories of mobile apps has dropped from 6.7 in 2009 to 3.7 today. The problem being that users now have to split their time across an increasing number of applications. Supporting that conclusion, Nielsen reported last spring that the average user now has 41 apps on their smartphone, up 28 percent from the 32 apps reported in 2011. Meanwhile, the mobile application stores have also been growing non-stop, with some 800,000 apps in Apple’s App Store and around 750,000+ for Android. Users seem to be gravitating to established publishers these days, as well. It’s very hard for newcomers to become breakout successes at this point, so the decks are already stacked against new apps before they ever go live. Back in 2011, around a quarter of mobile apps were downloaded, used once then abandoned. Today’s users are far more fickle, given their greater choice. According to Mobilewalla founder Anindya Datta, speaking to USA Today last year, an estimated 80 to 90 percent of apps are eventually deleted from users’ phones. Talk about having only one chance to make a good first impression. For what it’s worth, I can report my personal tolerance for new apps’ bad behavior is even lower than the norm, perhaps. I loathe the walkthrough for example. I can’t bother with apps that don’t offer sign-up through Facebook or Twitter at this point. And sometimes, even that isn’t good enough – if I’m unsure I’ll like an app and I can’t even get a sense of what it is before I get through the sign-up screen, sometimes I just never bother at all. Oh, and here’s another data point to chew on: Compuware’s study also reports that users expect apps to be far faster than mobile websites, with an average 2-second load time. Developers, maybe you had better kill that splash screen, too, while you’re at it.